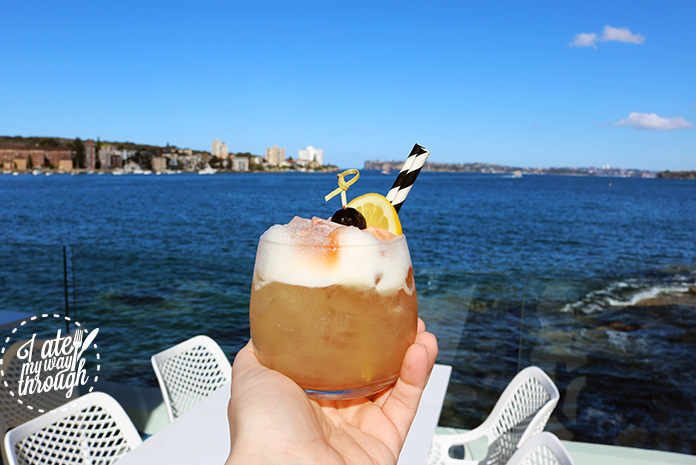 Nestled on picturesque Federation Point in Manly Cove is foodie favourite The Bistro at Manly Pavilion. 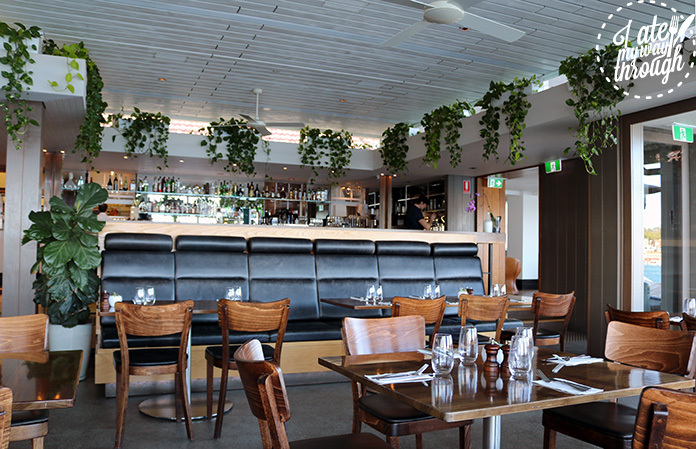 Boasting some of the best views in the cove, this unpretentious eatery has been gaining notoriety over the past year for it’s relaxed atmosphere and delightful dishes. On warmer days the wrap around balcony is the place to be, with guests fighting for the best position to soak up the sun. With that view would you blame them? I thought the interiors were just as impressive as the view they look out to. 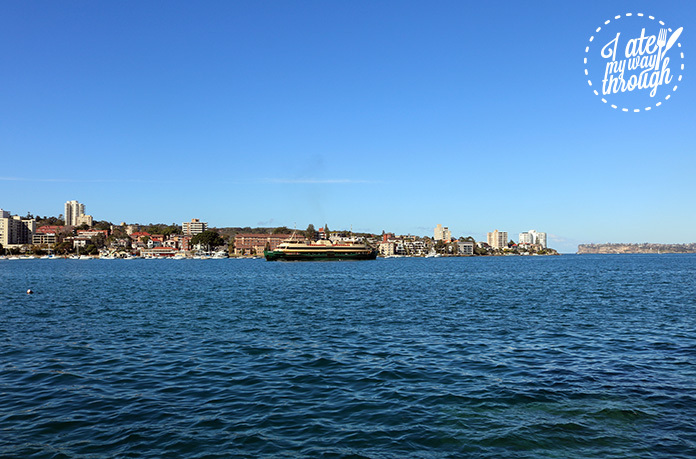 This heritage building oozes nautical charm and effortlessly sets in to the surrounds. 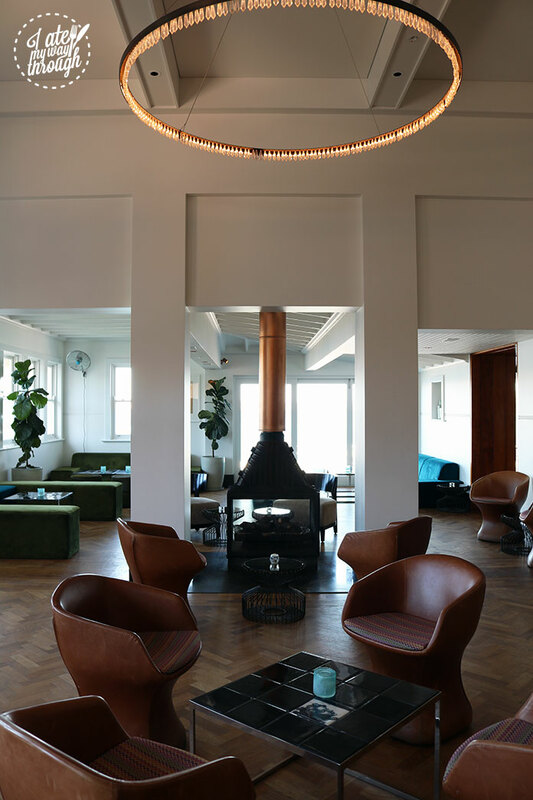 Firstly walking into a reception space perfect for a quiet drink with friends looking out the the cove, you instantly feel tranquil. With calming blue and green hues and natural wood notes that carry through to the dining space it’s easy to unwind here. 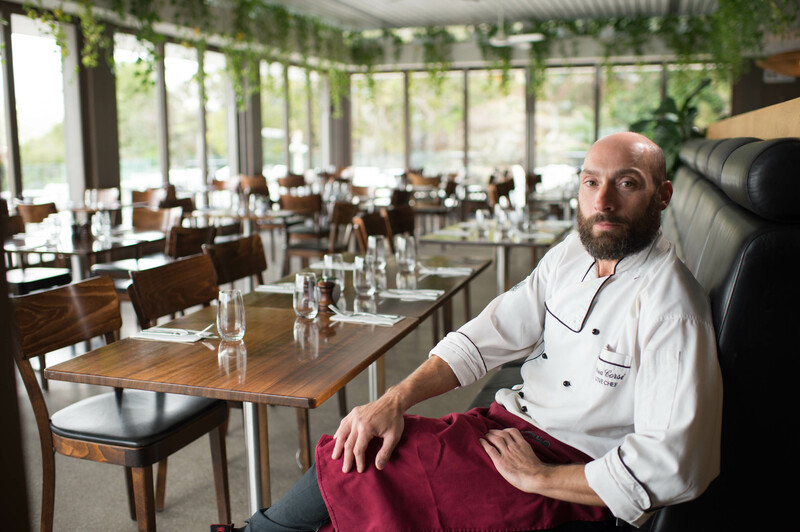 It was here that I met with the Manly Pavilion’s new executive chef Andrea Corsi. Born in Tuscany, to a sommelier father and his original cooking mentor – his mother, he laughed about his father and brother not being able to cook a thing, affectionately stirring that “they burn toast!”. Starting from humble beginnings as a 15 year old kitchen hand in a pizzeria, he started picking up things from the chefs like making pizza dough then onto more strenuous tasks like cleaning and preparing fish. From a quaint Tuscan pizzeria, he has certainly come far. Working under renowned international names like Raymond Blanc of Le Manoir aux Quat’ Saisons and then once in Australia working with the likes of Giovanni Pilu of Pilu at Freshwater and Cala Luna. He’s now settled in to The Bistro, which he describes as the whole package and a “fun, buzzy place”. His wealth of knowledge in Mediterranean cuisine has really come through in his reinvention of the Bistro menu and is a testament to his passion for his craft. No details have been spared or overlooked in his dishes, yet nothing feels over the top. Much like the venue itself, Corsi’s dishes hold an air of understated elegance. 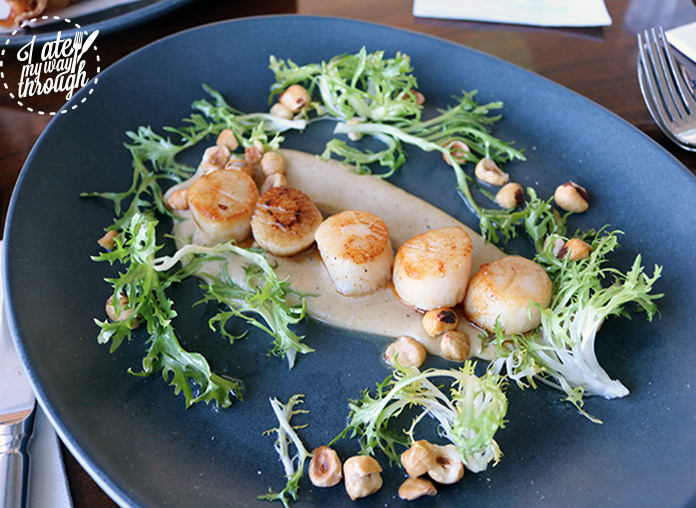 With way too many appealing options to choose from we settled on three of the top entrees, the first of which being the seared scallops ($24). The scallops were cooked to perfection, being both meaty and succulent. Served with flavoursome Jerusalem artichoke puree, hazelnuts and a subtle yet effective prawn oil this was a beautiful seafood dish to start the lunch. 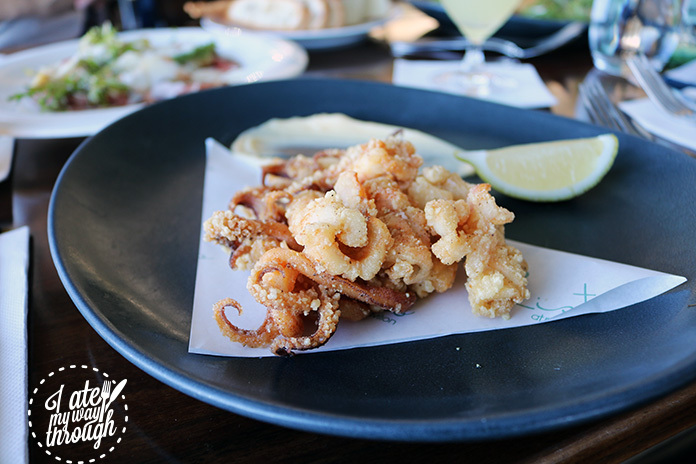 A classic seafood dish, the calamari in a salt and pepper batter ($19) was another great dish to start the lunch. Simplistic in it’s presentation with a streak of aioli and lemon wedge to dress the plate, Andrea really let the natural flavours of the calamari speak for themselves. These flavours were then enhanced by the light and cripsy salt and pepper coating which really drew the dish together as a whole. The final entree, and my favourite was the seared beef ($24). I may be a little biased because parmesan and balsamic vinegar are two of my favourite Italian ingredients, accompanied with artichoke and frisée atop the seared beef. It truly was grand. 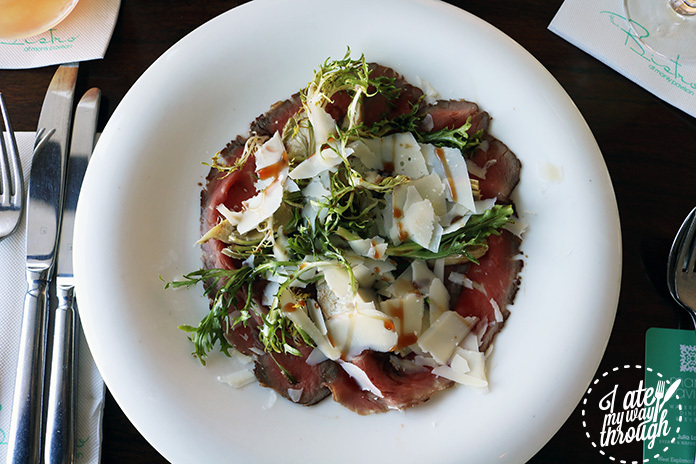 The seared beef, events and PR manger Julie told us, is the Bistro’s take on a carpaccio with the difference being that little extra searing to the beef. The pieces were expertly thin and melted in your mouth with smooth beef flavours that were heightened by the flavours of the other elements. A very light dish, it’s a fantastic way to whet the appetite in anticipation for the main courses. Another way to pass the time between courses, is to indulge in some cocktails that are knowledgeably put together by the Bistro’s bartending mixologist, Thomas. I opted for the Jasmine Sour ($19) made with Belvedere Vodka infused in house with jasmine and spiced herb syrup. As someone who doesn’t normally opt for sour cocktails, this one grew on me really quickly. The flavours were well balanced and not too sour, it would be very refreshing on a hot summers day. My partner went for the Pavilion Fizz ($19) a dizzyingly good mix of grape gin and muscat liqueur with lemon thyme syrup, citrus, and bitters fizzed up with club soda. Similar to the Jasmine Sour, this was also well mixed and balanced with each flavour making itself known through the drink. The cocktails being as delicious as they were, did not take long to finish at all. Luckily for the Bistro, they have not only one but two sommeliers in house. With executive chef Corsi following in his father’s footsteps and becoming a certified sommelier, as well as general manager John too being certified. Interestingly, when Corsi stepped into the executive chef role instead of changing the wine list to suit the dishes, he decided to make changes to the dishes to further suit the wines. 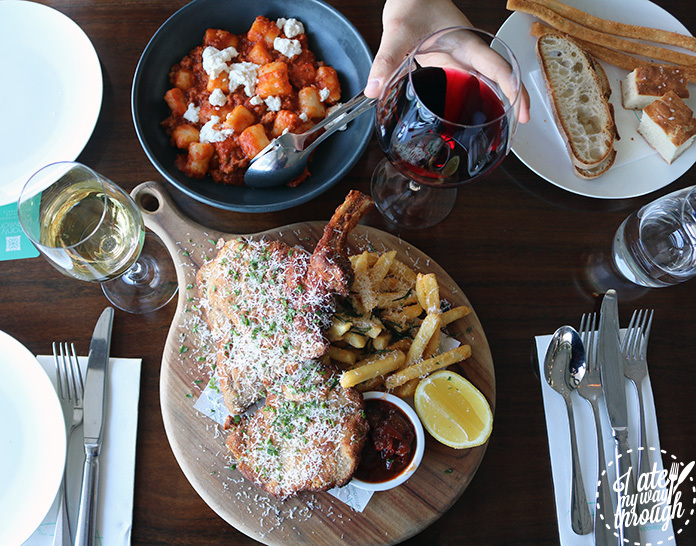 We asked John for some paired wines that would compliment our mains. He brought the Lethbridge Chardonnay 2015 Geelong, VIC ($15/$69) and the Vite Colte Rosso Fuoco Barbera DOCG 2015 Piemonte, ITA ($11/$52). Both wines were great choices and each resounded certain and different flavour aspects in both dishes. 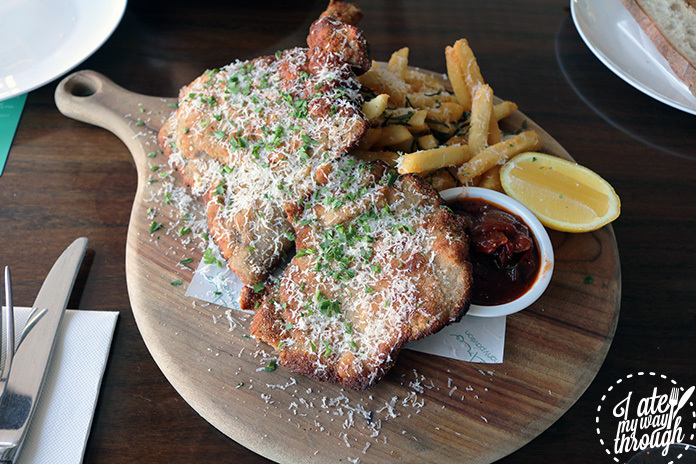 For mains Julie suggested to us a few dishes, one of which was the 250g Veal Milanese ($34). Served with Tuscan fries and capsicum & tomato relish we laughed that this was the equivalent of schnitzel and chips which would happily suit less adventurous eaters. 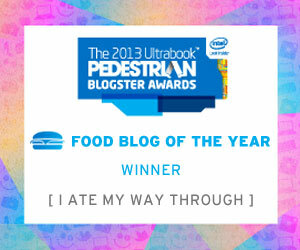 This does not at all mean that the dish was by any means average. The veal was tender, with a good crumb and my goodness was the portion size huge. As soon as it came out, I was questioning if we were going to finish it all (spoiler: we didn’t). The relish was very moreish, and great to layer on top of the veal or dip the chips into. The pork ragu ($27) was another dish that Julie recommended to us. Having been on their previous menu with fettucini, Andrea changed it up with house made gnocchi. He believes that these simple touches make all the difference to a dish and you really could taste the freshness of the gnocchi. 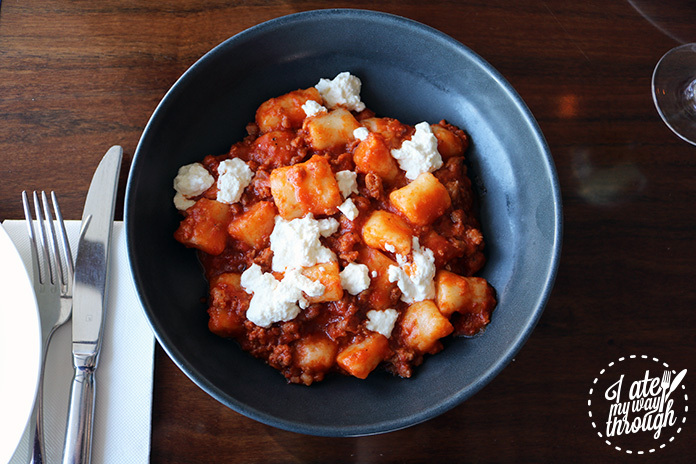 They were so soft and melted together in your mouth with the ragu and fresh ricotta. We later found out that the foccacia bread we had in the bread basket ($8) is also house made under Andrea’s guidance. You could tell that the bread was house made. The middle was springy and light, with a delicious crunchy crust to the outer layers. It also makes a great vessel to mop up any left over ragu! One can simply not visit the Manly Pav without eating “The Manly Pav” ($16). A well done pavlova round that was crisp on the outside and had an airy meringue centre, served with champagne cream, raspberries and passionfruit curd. 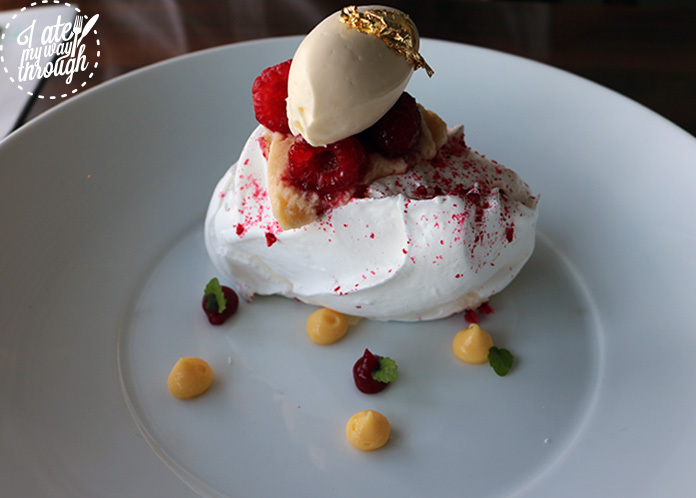 I’ll admit I’m not the biggest pavlova fan, but this one had me reaching back several times for “one last spoonful”. Tangy from the passionfruit and raspberries while sweet from the sugary meringue and cream, it was the best way to round out the lunch. Executive chef Andrea Corsi has done a wonderful job of jumping head first into his new role at The Bistro, and deserves commendations on his wonderful, impassioned menu.